Arles Amphitheatre dates to the 90 AD. 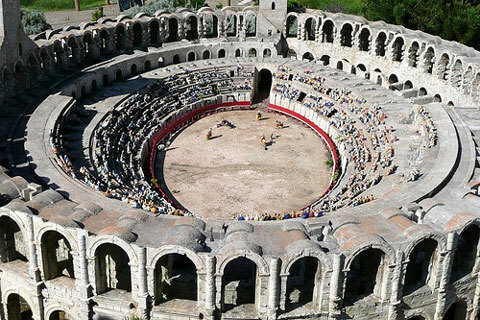 The amphitheatre was capable of seating over 20.000 spectators, and was built to provide entertainment in the form of chariot races and bloody hand-to-hand battles. Today, it draws large crowds for bullfighting as well as plays and concerts in summer.